Hello dear followers! Is it really, officially Autumn? The weather is slowly cooling down, the days are getting noticably shorter. I suppose it will be Winter before we know it. Speaking of cold and winter, my daughter turned six last week. She insisted on doing a Frozen theme. Well, my idea for executing the Frozen theme was pretty basic. I did not go all out like some of those mamas on Pinterest with way too much free time on their hands. I kept it simple. We gave out Frozen party favor baggies with various candies for the girls, and cars baggies for the boys. We gave her a few Frozen things as gifts. The cake was really the only thing that adhered to the theme. And I didn't even make it myself! I have been so short on time since school started! We ordered a half sheet cake from the Atlantis Bakery, simple white cake, white buttercream filling and frosting. I asked for light blue edge piping and darker blue text for "Happy Birthday Haley". They offered an edible image, so I took it. We also asked for a couple fondant flowers for a little extra oomph. They even gave it some edible sparkle. We zipped from the Atlantis to the party locale and I was ready to enhance the cake. I had hunted down a set of tiny dolls, Elsa, Anna, and Olaf, that I arranged on top along with a sparkly blue number six candle. I came prepared with extra sparkle dust, and some cans of Duff's spray coloring in blue and silver, but I didn't use them. The cake was "Frozen" enough with the dolls and candle. Voila! 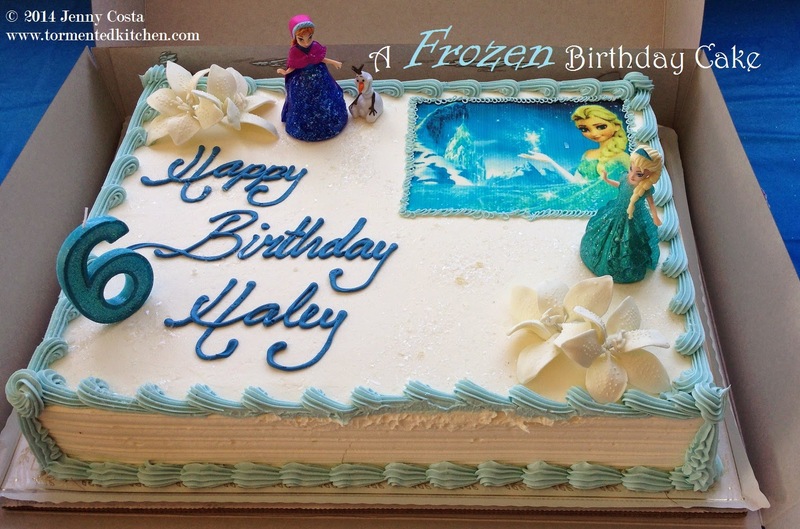 A super easy Frozen birthday cake was born!